Sat. Apr 28, 2:10pm. 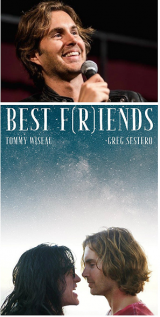 JOIN GREG SESTERO LIVE! See the on-screen reunion of The Room's cult-icons, Tommy Wiseau and Greg Sestero in Volume One of a two-volume cinematic saga. Tickets on sale now! Directed and co-produced by Canadian filmmakers, with Vancouverite Justin MacGregor at the helm, Best F(r)iends' LA noir aesthetic is boiling with maple goodness under the surface.